Eating at the Cafe' is easy as 1, 2, 3! 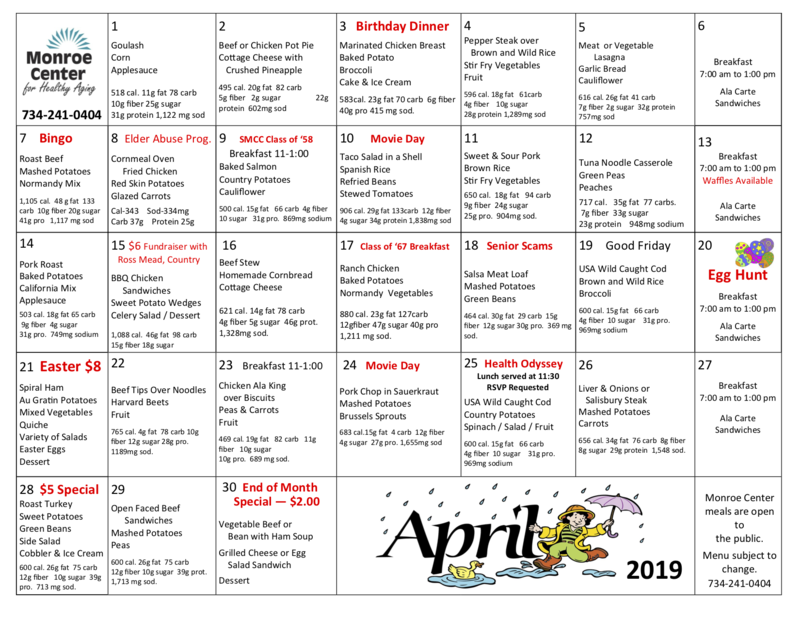 The Center has daily specials, along with a full breakfast and lunch menu Monday through Saturday, with a homestyle dinner prepared on Sunday. The monthly menu can be found on the last page of the newsletter under the Newsletter tab. Breakfast: 7 am to 10 am. On the second and fourth Tuesday, breakfast is available until 1:00 p.m. Breakfast is on a per item basis from a menu of many delicious items: Pancakes, Frenchtoast, Bacon, Sausage, Ham - Omelets - Biscuits and Gravey, Fruit, Oatmeal. There's something for everyone! Choose the Daily Main Choice ($2.75 for members) or Sandwiches, Soups, Salad Bar, BLT's, or Wraps. The Daily Special Price for a member is $5.30 and includes the main choice, salad bar, dessert and a drink. For $6.89 a guest can enjoy the same whole meal. These prices include tax. 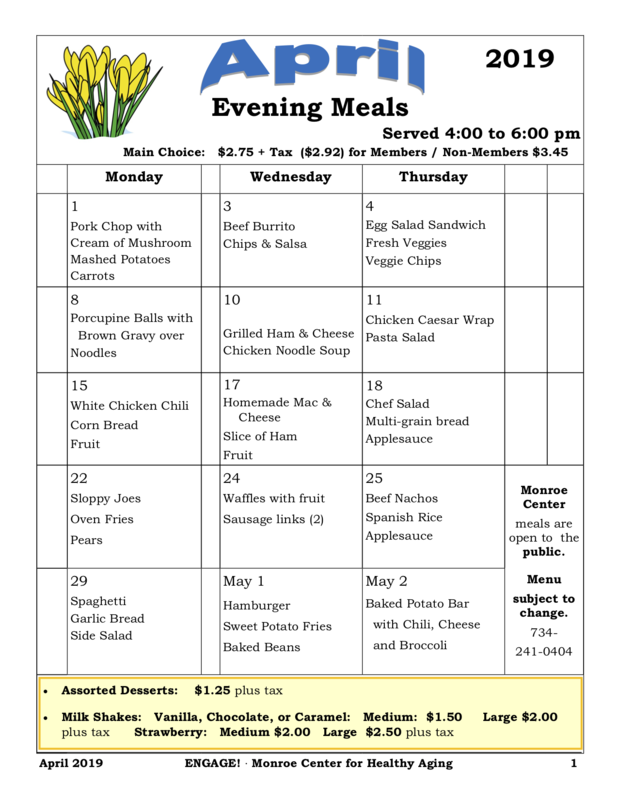 Evening meals are served on Monday, Wednesday and Thursday from 4:00-6:00 pm. Breakfast is on a per item basis from a menu of many delicious items: Pancakes, Frenchtoast, Bacon, Sausage, Ham - Omelets - Biscuits and Gravey, Fruit and oatmeal. There's something for everyone! Lunch is served per item basis, with additional sides and starts at 11 am. Sunday Dinners: Enjoy a friendly dining atmosphere. Served cafeteria style or relax at your table and let servers bring your food to your table. Dinner is served from 11 am to 1 pm and includes full dinners with home-cooked meats, salad bar, and home-baked pies. Prices (with tax) are $7.42 for members and $8.48 for guests. Salad Bar, Main choice alone, and dessert may be purchased separately.